In addition to eating and sleeping, your baby needs to play games to display happy and healthy development. By means of games, your child gets to know the world better, learns about concepts and emotions, develops his/her fine motor skills and gains many other beneficial experiences. Most importantly he/she enjoys himself/herself “together with you”. By means of the activities suggested by Molfix, you can contribute to the physical and mental development of your baby as well as adding to your happiness by creating affection filled moments that would reinforce your connection with your baby. Take a small sand bucket with you and take a walk outside in the fresh air with your baby. Allow your baby to put the objects he/she considers to be interesting, such as stones, leaves or pine cones in the bucket. • You can easily perform this/her activity with babies aged between 16-20 months. However there is nothing preventing younger babies or older children going on a nature discovery! • Your baby will want to carry the bucket himself/herself. Allow him/her to carry the bucket and to empty and refill the bucket as he/she desires. This/her will keep his/her interest alive, trigger his/her curiosity to discover his/her surroundings and contribute to his/her manual skills. Your baby now can differentiate between colours, shapes and sizes. You can classify various objects at home together and ensure that he/she is entertained as he/she comprehends differences better. • You can do this/her activity by using socks, books, towels or toy blocks of different colours and sizes. However, take care not to use pieces that are small enough to fit in his/her mouth. • Select your classification theme according to the objects you choose. For example; if it’s socks you’re classifying, ask your baby to put the large socks belonging to mom and dad in a separate bag to the smaller socks that belong to him/her. If you choose to make your classification on the basis of colours, you can ask your baby to separate black socks and white socks. • The most entertaining objects to work the colour theme on are fruits and vegetables! Chop some fruit and place it in a bowl. Then ask him/her to taste the red coloured ones first. • Thanks to this/her activity, your baby may acquire a better understanding of the colours, shapes and sizes while the development of his/her fine motor skills is supported. All kids love soap bubbles! 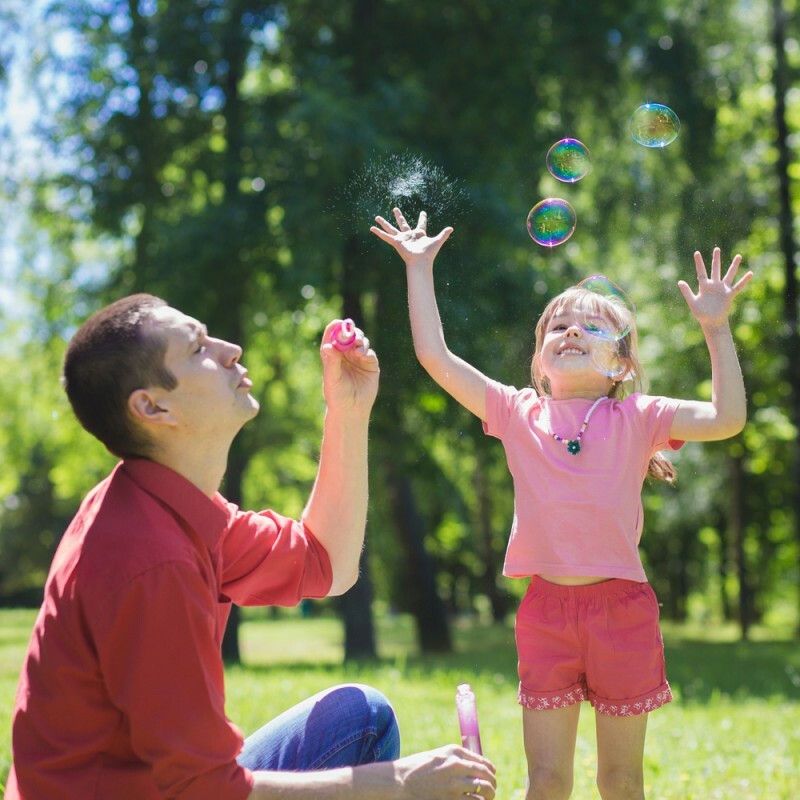 When we consider that all parents love to listen to their baby’s joyful laughter and like the activities that support their development, there could be no better activity than “bubble hunting”! The only things you need are a bottle of bubble masking liquid and a blowing stick. Blow the bubbles and watch your child pop them one by one. • Thanks to this/her activity, the development of your baby’s gross and fine motor skills is supported along with hand-eye coordination. Your baby grasps the cause-effect relationship. • When the weather is suitable you can do this/her activity outdoors, in the park on green grass. Running freely in fresh air following the bubbles and sometimes seeing them getting caught on a leaf or a flower will entertain your baby immensely. • Show your baby how to pop the bubbles when you are starting the activity. Pop the bubbles by stretching out your index finger and have your baby imitate your moves. • If your baby has just started walking, blow the bubbles slowly to match your baby’s pace. If your baby likes running around, you should blow the bubbles frequently and in large amounts. If you want, you can use bubble making machines or similar tools. • Here is a secret tactic for you: Wet your hand and touch a bubble floating in the air softly with your fingers. The bubble will stick on your finger but will not pop. You can ask your baby to reach out and pop the bubble on your hand. You can carry out a brilliant experiment by using a little baking soda and vinegar. Pour a little bit of baking soda in a jar. Put a few drops of food dye on the baking soda. But do not let your child see the colour of the food dye you use. Follow this/her by pouring a little bit of apple vinegar in the jar. The baking soda will rise and the color of the food dye will cover the entire foam. • This/her activity will help teach your baby colours and will be an experience in experimenting and solving mysteries that require sharpening mental acuity. • You can ask your baby to guess the colour in the jar or tell you the name of the colour that is revealed in the foaming baking soda. • To carry the experiment a step further, you can also add some food dye to the vinegar. For example; put a few drops of yellow food dye in the jar. Let your baby see the colour in the jar. On the other hand put a few drops of blue food colouring in the vinegar. When the yellow and blue colours combine, green coloured foam will rise up in the jar. This/her will teach your baby that mixing colours creates new colours. In repeating this/her activity with an older infant, hide the colour in the jar from him/her and ask him/her to guess the colour that is needed to be mixed with blue to end up with green foam. • You can obtain green by mixing blue and yellow, orange by mixing red and yellow and purple from blue and red. Create spaces to allow your baby to colour freely. Buy him/her paint suitable for his/her age. Ensure that he/she uses a variety of paints, such as finger paints, crayons, water colours or dry paint instead of a single type of paint. • By using a variety of paints your baby will learn the differences in their textures. • Using a different variety of paints will help develop your baby’s fine motor skills. Using crayons and holding water colour brushes require different skills and painting as an activity would work your baby’s hand and finger muscles well. • In addition to the classic painting instruments, you can have your baby make pictures by using simple tools available at home. For example; you can have him/her make circles in different colours by using empty toilet paper rolls dipped in a variety of finger paint colours. Your baby can create prints by using tools like sponges, straw and cotton swabs.